Ever wondered what it was like to be a stuntman? To face your fears daily as a profession? 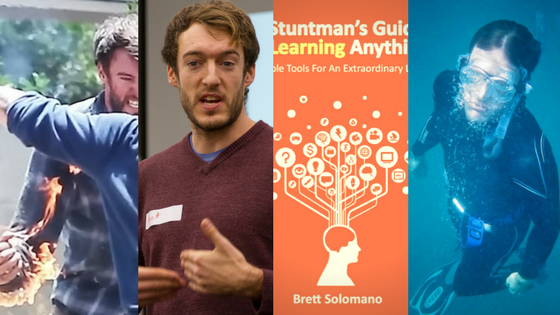 Well, this week we sit down fellow stuntman, Brett Solomano, to talk about how he overcomes those fears, unconventional networking tips, relationships, and more! So you want to learn faster huh? Firstly why don’t you read through My Book again (particularly Chapter 3!!) and learn to read faster?To best self-educate, your way to reading faster here are my recommendations! Google search speed reading and see what blogs are sharing their ideas for free. Remember, just a few ideas is all you need to get you started! Watch a few videos on youtube. Again, just do a search and see what comes up for you. I don’t know what you’ll find. Just explore! Chat with a few students who do lots of reading and study to see how they read fast. Do they read? Do they skim? What does it look like for them to devour loads of information fast before an exam? Now, finally, those few things that you have just learned, all those little elements, IMPLEMENT THEM! Reread Chapter 8 of my book and see what comes up for you. Grind it all together and see what it takes for you to improve your speed and your comprehension. And watching videos or listening to audio?? A lot of programs have started having speed adjustment functions within them to help you listen to audio and watch videos faster. I started with a program called MySpeed for online videos and VLC for offline videos. Nowadays even Youtube has its own function to adjust speed in the bottom right corner of the video screen! The trick with watching videos at faster speeds is (like with anything really!) to start small and allow your brain to get used to. Perhaps 1.25x then to 1.5x a week later?? I often listen to audio up to 3x or higher! But will often spend most of my time listening to audio around 1.5x - 2x depending on how dense the audio is.Anyway, more about that in My Book. How fast can you watch videos at?? Got any tips for learning faster?? I'd love to hear! Click here to email me with your best learning tips.